This is the first flat-bottom pouch I've ever made. I'm not sure why I never attempted one before, but I have to say, I'll probably be making most of my pouches this way from now on. I love how much more room the flat bottom provides. 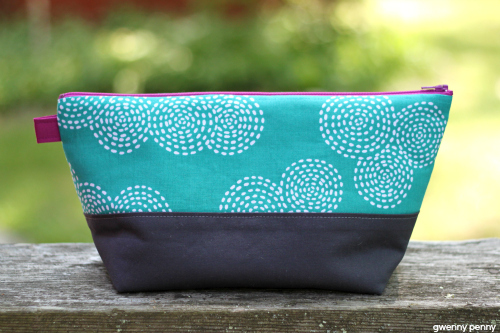 And this is a pretty big pouch... it's 12" wide, 6" tall, and 4.5" deep. 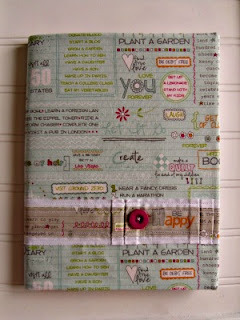 Stay tuned for another It's My Party and I'll Craft if I Want To project on Friday! Love your choice of fabrics, and I can see why the flat bottom would work well. Is there a pattern or tutorial available for this? I love it!! I'd like the tutorial for this too! I have a lot of little pieces of fabric that would be perfect for it! Love the fabric, especially the inside color. I am also interested in the tutorial as well. Thanks for sharing! The zipper is a little different than mine, but it gives the same type of flat-bottom pouch. beautiful work! 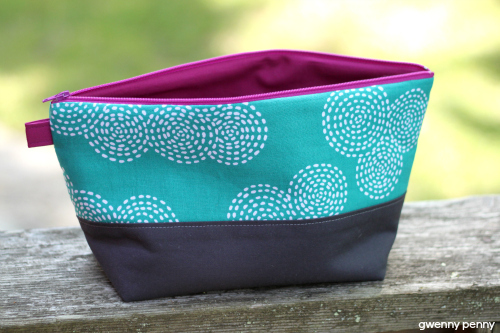 the colour of the zipper is absolutely perfect to set the entire project apart! Happy Birthday celebrations! Those colours really pop! Beautiful pouch.